Mark A. Pollack and Gregory C. Shaffer. 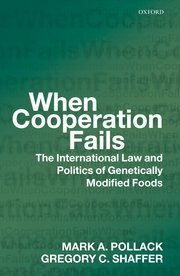 When Cooperation Fails: The Global Law and Politics of Genetically Modified Organisms (New York: Oxford University Press, 2009). Mark A. Pollack. 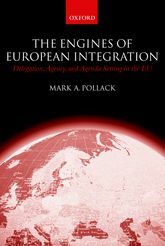 The Engines of European Integration: Delegation, Agency and Agenda Setting in the EU (New York: Oxford University Press, 2003). Jeffrey L. Dunoff and Mark A. Pollack, eds. 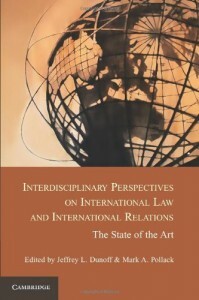 Interdisciplinary Perspectives on International Law and International Relations: The State of the Art (New York: Cambridge University Press, January 2013). Helen Wallace, Mark A. Pollack and Alasdair Young, eds. 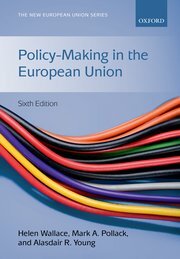 Policy-Making in the European Union, 6th edition (New York: Oxford University Press, 2010). Helen Wallace, William Wallace, and Mark A. Pollack, eds., Policy-Making in the European Union, 5th edition (New York: Oxford University Press, 2005). Amy G. Mazur and Mark A. Pollack, editors. Gender and Public Policy in Europe, special issue of Comparative European Politics, Vol. 7, No. 1 (March 2009), pp. 1-177. Knud Erik Jørgensen, Mark A. Pollack, and Ben Rosamond, eds. 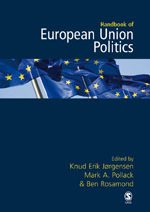 The Handbook of European Union Politics (New York: Sage Publications, 2007). David Andrews, Mark A. Pollack, Gregory C. Shaffer, Mark A. Pollack, and Helen Wallace, eds., The New Transatlantic Agenda and the Future of Transatlantic Economic Governance (Florence: European University Institute, 2005). 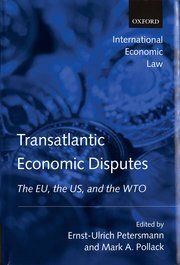 Ernst-Ulrich Petersmann and Mark A. Pollack, eds., Transatlantic Economic Disputes: The US, the EU, and the WTO (New York: Oxford University Press, November 2003). 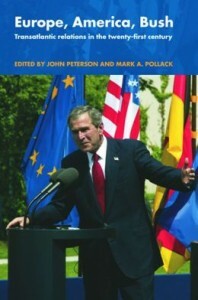 John Peterson and Mark A. Pollack, eds., Europe, America, Bush: Transatlantic Relations in Transition (New York: Routledge Press, 2003). 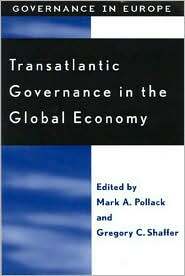 Mark A. Pollack and Gregory C. Shaffer, eds., Transatlantic Governance in the Global Economy (Lanham, MD: Rowman & Littlefield Press, 2001). Manfred Elsig and Mark A. Pollack. “Agents, Trustees, and International Courts: The Politics of Judicial Appointment at the World Trade Organization,” European Journal of International Relations (forthcoming). Gregory C. Shaffer and Mark A. Pollack. “Hard Law, Soft Law, and International Security: The Cases of Nuclear Weapons and the Responsibility to Protect,” Boston College Law Review, Vol. 52, No. 4 (2011), pp. 1147-1241. Mark A. Pollack and Emilie M. Hafner-Burton. “Mainstreaming International Governance: The Environment, Gender, and IO Performance in the European Union,” Review of International Organizations, Vol. 5, No. 3 (2010), pp. 285-313. Gregory C. Shaffer and Mark A. Pollack. “Hard Law vs. Soft Law: Alternatives, Complements and Antagonists in International Governance,” Minnesota Law Review, Vol. 94, No. 3 (February 2010), pp. 706-799. Emilie M. Hafner-Burton and Mark A. Pollack. “Mainstreaming Gender in the European Union: Getting the Incentives Right,” Comparative European Politics, Vol. 7, No. 1 (March 2009), pp. 114-138. Mark A. Pollack and Gregory C. Shaffer. “Transatlantic Economic Relations: Continuity amid Discord,” EPS: European Political Science, Vol. 5, No. 1 (February 2006), pp. 62-68. Mark A. Pollack. “Theorizing the European Union: International Organization, Domestic Polity, or Experiment in New Governance?” Annual Review of Political Science, Vol. 8 (2005), pp. 357-98. Mark A. Pollack. “Control Mechanism or Deliberative Democracy? Two Images of Comitology,” Comparative Political Studies, Vol. 36, No. 1/2 (February/March 2003). Mark A. Pollack. “Learning from the Americanists (Again): Theory and Method in the Study of Delegation,” West European Politics, Vol. 25, No. 1 (January 2002), pp. 200-219. Emilie Hafner-Burton and Mark A. Pollack. “Mainstreaming Gender in Global Governance,” European Journal of International Relations, Vol. 8, No. 3 (September 2002), pp. 339-73. Emilie Hafner-Burton and Mark A. Pollack. “Gender Mainstreaming and Global Governance,” Feminist Legal Studies, Vol. 10, No. 3 (2002), pp. 285-298. Mark A. Pollack. “International Relations Theory and European Integration,” Journal of Common Market Studies, Vol. 39, No. 2 (June 2001), pp. 221-44. Mark A. Pollack and Emilie Hafner-Burton. “Mainstreaming Gender in the European Union,” Journal of European Public Policy, special issue on “Women, Power and Public Policy,” Vol. 7, No. 3 (2000): 432-456. Mark A. Pollack. “The End of Creeping Competence? EU Policymaking Since Maastricht,” Journal of Common Market Studies, Vol.38, No. 3 (September 2000): 519-538. Mark A. Pollack. “Delegation, Agency and Agenda Setting in the European Community,” International Organization, Vol. 51, No. 1 (Winter 1997), pp. 99-134. Reprinted in Brent F. Nelson and Alexander Stubb, eds., The European Union: Readings on the Theory and Practice of European Integration, 3rd edition (Boulder: Lynne Rienner, 2003), pp. 255-80. Mark A. Pollack. “Representing Diffuse Interests in EC Policymaking,” Journal of European Public Policy, Vol. 4, No. 4 (December 1997), pp. 572-590. Mark A. Pollack. “The New Institutionalism and EU Governance: The Promise and Limits of Institutionalist Analysis,” Governance, Vol. 9, No. 4 (October 1996), pp. 429-458. Mark A. Pollack. “Creeping Competence: The Expanding Agenda of the European Community,” Journal of Public Policy, Volume 14, No. 2 (March-June 1994), pp. 95-145. Mark A. Pollack. “The New EU Legal History: What’s New, What’s Missing?” (February 28, 2013). American University International Law Review, forthcoming 2013; Temple University Legal Studies Research Paper No. 2013-09. Available at SSRN: http://ssrn.com/abstract=2207170. Jeffrey L. Dunoff and Mark A. Pollack. “Introduction: International Law and International Relations – Taking Stock,” in Dunoff and Pollack, eds. Interdisciplinary Perspectives on International Law and International Relations: The State of the Art (New York: Cambridge University Press, 2013), pp. 3-32. Jeffrey L. Dunoff and Mark A. Pollack. “Conclusions: Reviewing Two Decades of IL/IR Scholarship: What We’ve Learned, What’s Next,” in Dunoff and Pollack, eds. Interdisciplinary Perspectives on International Law and International Relations: The State of the Art (New York: Cambridge University Press, 2013), pp. 626-661. Gregory C. Shaffer and Mark A. Pollack. “Hard and Soft Law,” in Jeffrey L. Dunoff and Mark A. Pollack, eds., Interdisciplinary Perspectives on International Law and International Relations: The State of the Art (New York: Cambridge University Press, 2013), pp. 197-222. Mark A. Pollack and Gregory C. Shaffer. “The Interaction of Formal and Informal Lawmaking,” in Joost Pauwelyn, Ramses Wessel and Jan Wouters, eds., Informal International Lawmaking (Oxford: Oxford University Press, 2012). Mark A. Pollack. “Theorizing the European Union: Realist, Intergovernmentalist and Institutionalist Approaches,” Chapter 1 in Erik Jones, Anand Menon and Stephen Weatherill, eds., The Oxford Handbook of the European Union (Oxford: Oxford University Press, 2012), pp. 3-17. Mark A. Pollack. “Living in a Material World: A Critique of Normative Power Europe,” in Hubert Zimmerman and Andreas Dür, eds., Key Controversies in European Integration (London: Palgrave, 2012). Gregory C. Shaffer and Mark A. Pollack. “How Hard and Soft Law Interact in International Regulatory Governance: Alternatives, Complements, and Antagonists,” in Simon Evenett and Robert Stern, eds., Systemic Implications of Transatlantic Regulatory Cooperation and Competition (London: World Scientific, 2011). Mark A. Pollack, Helen Wallace, and Alasdair R. Young. “An Overview,” chapter 1 in Helen Wallace, Mark A. Pollack and Alasdair Young, eds., Policy-Making in the European Union, 6th edition (New York: Oxford University Press, 2010), pp. 3-13. Mark A. Pollack. “Theorizing EU Policy-Making,” chapter 2 in Helen Wallace, Mark A. Pollack and Alasdair Young, eds., Policy-Making in the European Union, 6th edition (New York: Oxford University Press, 2010), pp. 14-43. Mark A. Pollack and Gregory C. Shaffer. “Biotechnology Policy: Between National Fears and Global Disciplines,” chapter 14 in Helen Wallace, Mark A. Pollack and Alasdair Young, eds., Policy-Making in the European Union, 6th edition (New York: Oxford University Press, 2010), pp. 327-51. Mark A. Pollack, Helen Wallace, and Alasdair R. Young. “EU Policy-Making in Challenging Times: Adversity, Adaptability, and Resilience,” chapter 20 in Helen Wallace, Mark A. Pollack and Alasdair Young, eds., Policy-Making in the European Union, 6th edition (New York: Oxford University Press, 2010), 473-94. Mark A. Pollack. “Europe United? The Impact of the EU’s Eastern Enlargement, Five Years On,” European View, Vol. 8, No. 2 (December 2009), pp. 239-54. Mark A. Pollack. “The European Union’s Democratic Deficit: Diagnoses, Prognoses, and Reforms,” in Knud Erik Jørgensen, ed., European Democracy: Foundations, Milestones, Future Perspectives (Copenhagen: Ministry of Foreign Affairs of Denmark, November 2009), pp. 121-138. Amy G. Mazur and Mark A. Pollack. “Introduction: Gender and Public Policy in Europe,” Comparative European Politics, Vol. 7, No. 1 (March 2009), pp. 1-11. “The New Institutionalisms and European Integration,” in Antje Wiener and Thomas Diez, eds., European Integration Theory 2nd edition (New York: Oxford University Press, 2009), pp. 137-56. Gregory C. Shaffer and Mark A. Pollack. “The EU Regulatory System for GMOs,” in Ellen Vos, Michelle Everson and Joanne Scott, eds. Uncertain Risks Regulated: National, EU and International Regulatory Models Compared (London: University College/Cavendish Press, 2008), pp. 269-94. Mark A. Pollack and Molly Ruhlman. “The Heroic Age of European Integration is Over: Institutional and Policy Developments in the EU, 1957-2007,” in David Phinnemore and Alex Warleigh-Lack,” eds., Reflections on European Integration (London: Routledge, 2008), pp. 43-73. Mark A. Pollack and Gregory C. Shaffer. “Risk Regulation, Genetically Modified Foods, and the Limits of Deliberation in the Council of Ministers,” in Daniel Naurin and Helen Wallace, eds., Unveiling the Council of the EU. Games Governments Play in Brussels (London: Palgrave Macmillan, 2008), pp. 144-164. Mark A. Pollack. “Rational Choice and EU Politics,” Chapter 2 in Knud Erik Jørgensen, Mark A. Pollack, and Ben Rosamond, eds. The Sage Handbook of European Union Politics (New York: Sage Publications, 2007), pp. 31-56. Mark A. Pollack. “Delegation and Discretion in the European Union,” in Darren Hawkins, David A. Lake, Daniel Nielsen and Michael J. Tierney, eds., Delegation and Agency in International Organizations (New York: Cambridge University Press, 2006), pp. 165-196. Mark A. Pollack. “JCMS Annual Lecture: The New Transatlantic Agenda at Ten: Reflections on an Experiment in International Governance,” Journal of Common Market Studies, Vol. 43, No. 5 (December 2005), pp. 899-919. Mark A. Pollack. “Theorizing EU Policy-Making,” in Helen Wallace, William Wallace, and Mark A. Pollack, eds., Policy-Making in the European Union (New York: Oxford University Press, 2005), pp. 13-48. Helen Wallace, William Wallace, and Mark A. Pollack. “An Overview,” in Helen Wallace, William Wallace, and Mark A. Pollack, eds., Policy-Making in the European Union (New York: Oxford University Press, 2005), pp. 3-11. Mark A. Pollack and Gregory C. Shaffer. “Biotechnology Policy: Between National Fears and Global Disciplines” in Helen Wallace and William Wallace, eds., Policy-Making in the European Union (New York: Oxford University Press, 2005), pp. 329-51. Mark A. Pollack and Gregory C. Shaffer, “The Future of Transatlantic Economic Relations: Continuity Amid Discord,” in Andrews et al., The Future of Transatlantic Economic Governance: Continuity Amid Discord (Florence: European University Institute, 2005), pp. 3-8. Gregory C. Shaffer and Mark A. Pollack. “Reconciling (or Failing to Reconcile) Regulatory Differences: The Ongoing Transatlantic Dispute over the Regulation of Biotechnology,” in David Andrews, Mark A. Pollack, Gregory C. Shaffer, and Helen Wallace, eds., The Future of Transatlantic Economic Governance : Continuity Amid Discord (Florence: European University Institute, 2005), pp. 167-229. Mark A. Pollack. “The New Institutionalisms and European Integration,” in Antje Wiener and Thomas Diez, eds., European Integration Theory (New York: Oxford University Press, 2004), pp. 137-56. Mark A. Pollack. “The Political Economy of Transatlantic Trade Disputes,” Chapter 2 in Ernst-Ulrich Petersmann and Mark A. Pollack, eds., Transatlantic Trade Disputes: The US, the EU, and the WTO (New York: Oxford University Press, 2003). Mark A. Pollack. “Policy Statement: Managing System Friction,” in Ernst-Ulrich Petersmann and Mark A. Pollack, eds., Transatlantic Trade Disputes: The US, the EU, and the WTO (New York: Oxford University Press, 2003). John Peterson and Mark A. Pollack. “Introduction: Europe, America, Bush,” chapter 1 in John Peterson and Mark A. Pollack, eds., Europe, America, Bush: Transatlantic Relations in Transition (New York: Routledge, 2003), pp. 1-12. Mark A. Pollack. “Unilateral America, Multilateral Europe?” chapter 9 in John Peterson and Mark A. Pollack, eds., Europe, America, Bush: Transatlantic Relations in Transition (New York: Routledge, 2003), pp. 115-127. John Peterson and Mark A. Pollack. “Conclusion: The End of Transatlantic Partnership?” Chapter 10 in John Peterson and Mark A. Pollack, eds., Europe, America, Bush: Transatlantic Relations in Transition (New York: Routledge, August 2003), pp. 128-142. Stacy A. Nyikos and Mark A. Pollack. “Researching the European Union: Qualitative and Quantitative Approaches,” in Tanja Boerzel and Rachel Cichowski, eds., The State of the European Union, Volume IV: Law, Politics, and Society (New York: Oxford University Press, Fall 2003). Mark A. Pollack and Gregory C. Shaffer. “Transatlantic Governance in Historical and Theoretical Perspective,” in Pollack and Shaffer, Transatlantic Governance in the Global Economy, pp. 3-42. Mark A. Pollack and Gregory C. Shaffer. “The Challenge of Reconciling Regulatory Differences: Food Safety and GMOs in the Transatlantic Relationship,” in Pollack and Shaffer, Transatlantic Governance in the Global Economy, pp. 153-178. Translated into French as “Vers un compromis transatlantique sur les OGM?” in Jacques Bourrinet and Sandrine Maljean-Dubois, Le commerce international des organisms génétiquement modifiés (Paris: La documentation française, 2002), pp. 305-315. Mark A. Pollack and Gregory C. Shaffer. “Who Governs?” in Pollack and Shaffer, eds., Transatlantic Governance in the Global Economy, pp. 287-305. Mark A. Pollack and Gregory C. Shaffer. “Biotechnology: The Next Transatlantic Trade War?” The Washington Quarterly, Vol. 23, No. 4 (Autumn 2000), pp. 41 54. John D. Donahue and Mark A. Pollack. “Centralization and its Discontents: The Rhythms of Federalism in the United States and the European Union,” in Kalypso Nicolaidis and Robert Howse, eds., The Federal Vision: Legitimacy and Levels of Governance in the United States and the European Union (New York: Oxford University Press, 2001). Mark A. Pollack. “Blairism in Brussels: The Third Way in Europe Since Amsterdam,” in Maria Green Cowles and Michael Smith, eds., The State of the European Union, Volume V (New York: Oxford University Press, 2001), pp. 266-291. Mark A. Pollack. “A Blairite Treaty? Neoliberalism and Regulated Capitalism in the Treaty of Amsterdam,” in Karlheinz Neunreither and Antje Wiener, eds., European Integration After Amsterdam: Institutional Dynamics and Prospects for Democracy (New York: Oxford University Press, 2000), pp, 266-289. Mark A. Pollack. “The Engines of Integration? Supranational Autonomy and Influence in the European Union,” in Wayne Sandholtz and Alec Stone Sweet, eds., European Integration and Supranational Governance (New York: Oxford University Press, 1998), pp. 217-249. Mark A. Pollack. “The Commission as an Agent,” in Neill Nugent, ed., At the Heart of the Union: Studies of the European Commission (London: Macmillan, 1997), pp. 145-166. Mark A. Pollack. “The United States of America,” in G. Ciavarini Azzi, ed., Survey of Current Political Science Research on European Integration Worldwide: 1994-1997 (Brussels: International Political Science Association Research Committee on European Unification, 1997). Mark A. Pollack. “Regional Actors in an Intergovernmental Play: The Making and Implementation of EC Structural Policy,” in Sonia Mazey and Carolyn Rhodes, eds., The State of the European Union, Vol. III (Boston: Lynne Rienner, 1995), pp. 361-90.